To celebrate entering our 5th year in partnership with Deltasimons we will be rolling back the years in style and taking the Aquathon series back to grass roots – some might say old school! We will no longer have chip timing but there will be a finish line clock to check in on your time, there will be still be swim hats and t-shirts for all – and we mean all – Adults and Juniors! More than this we are also pleased to be partnered by the BTF to provide a fully accredited Open Water Aquathon series that will also be registered Go-Tri events, one of very few such events that take part in Open water in the UK. As a registered Go-Tri event everyone who races in the Deltasimons Aquathon will be covered by third party insurance (day licence) provided by the BTF every time that they race with us. Biggest news of all – there will be no race entry fees! There will be a one off series registration fee of JUST £10 (this covers all 5 races) so you will get to race any or all of our five events for a tenner during 2018 once you have registered. You will need to pay your lake entry fee to Activities Away but working with Deltasimons we will not be charging you a penny to race once you have registered. Check out our Aquathon Video Here! Our friendly Aquathon events (swim/run) are ideal training for all. We attract a friendly bunch of participants who are keen to enjoy each event. As well as being enjoyable the Aquathons are a great opportunity to experience multisport racing for the first time or for experienced athletes to practice your race tactics and transitions for your upcoming “A” race. “We are proud to have Deltasimons as our series sponsor. Not only do Deltasimons care about the environment nationally and globally, importantly for us they really get involved at a local level too. 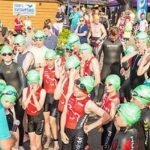 Based in Lincoln Deltasimons provide us with a comprehensive water testing protocol which ensure we all swim in clean water, they also make superb events like this possible because they support the community within the environment as well! All Aquathons are held on Wednesday evenings once a month through the summer. It couldn’t be easier to take part, either sign up on online or print off the entry form and bring it with you on the evening itself to the venue (you can even sign up on the night) – just arrive in plenty of time to register before you race! Where: Activities Away, Thorpe Lane, Lincoln, LN6 9NW. 1) Each event may be booked on the day. 2) Athletes are required to complete an annual registration. 3) Athletes may only race within distances specified by the British Triathlon Federation. 4) Refunds will not be given if you do not attend the event after registration. 5) The decision of the Event Director will be final in all matters.